De 14x25 Elite is het ultieme inflatable raceboard. 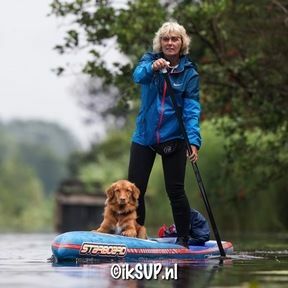 Het heeft een totaal eigen boardshape waardoor het board optimaal door het water snijdt en garant staat voor veel snelheid! De 14 Elite is ook verkrijgbaar in 27" en heeft dan een iets breder tail waardoor de 27 board iets stabieler is. If you’re in the 14’ race class, this is the inflatable race board to get. The Red Paddle Co 14’ x 25″ Elite is a machine built for speed. At 14’ long and just 25″ wide, it has been shaped to cut through the water like a hot knife through butter. It rides high at 150mm thick, reducing drag, while double nose runner fins keep the board tracking straight without creating drag, a combination that lies at the heart of what makes this board so fast and so easy to control in race conditions. It’s also a great downwind board – it picks up swell and glides beautifully. All this in a board you can deflate, pack away and carry home in a backpack! Our patented RSS system stiffens the board so there’s no flex, and the board comes with a built-in US Fin Box system, allowing you to adjust your fin to suit your style. The swept back design of the glass fibre fin prevents any debris from getting caught whilst paddling so you can focus on putting down the power. Extra rigidity to triumph in extreme circumstances. Forward Flex Control or FFC is a patented innovation by Red Paddle Co that stiffens the front section of the board to remove the flex created in sprinting phases of a race and when paddling into waves. It also increases board speed to give you the competitive edge by channeling the energy to the back of the board. The system is made up of a carbon compression strut that works in combination with RSS to deliver a more rigid ride.